Planting a tree lets you mark a birth, anniversary or bereavement. Trees improve the appearance of the city while fighting pollution and supporting wildlife. 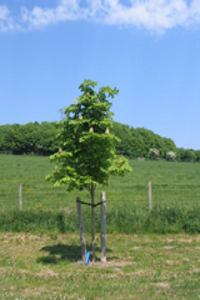 We charge £314 to plant a specific tree in a favoured location. We provide the tree, a certificate and a guarantee to replace the tree if it fails to establish in its first year. You can also ask to be involved in the planting of the tree. A wide range of trees can be planted on our chalky loam. However some parks have specific landscaping schemes. There is more information below. Please contact us if you need more details. Request to plant a tree Make a request by 30 September for this tree planting season. The main tree planting season is from December to March (dependent on weather conditions). The cut off date for applications for this tree planting season is 30 September. If we receive your request after 30 September 2017 your tree will be planted during next year's planting season, starting in December 2018. As the venues are for the active enjoyment of all users, it will not be permitted to place flowers at the planting site. Should such a memorial be required, we would respectfully advise the donor to consider a site in the local cemeteries. Unfortunately it will not be possible to allow the fixing of plaques at any donated tree. You are welcome to be involved in the planting of your tree and we can often tailor planting ceremonies to meet a wide range of occasions and personal requirements. There's a list of parks and open spaces available for donated tree planting below. If a site is over planted, you may need to choose another location. As well as tree planting parks and open spaces, it's also sometimes possible to donate trees to complement street plantings. Only tree-lined streets where spaces exist can be considered. We'll also need to check the location to see what services and utilities are under the planting area. In some instances it may not be possible to plant trees because of the position of utilities. If you want to ask about other parks or open spaces where you could plant a tree please e-mail arboriculture@brighton-hove.gov.uk. Complete our online form to request the planting of a tree.